When more than two participants have a conflict of interest, finding a mutual agreement may entail a time consuming process especially when the number of participants is high. Automated negotiation tools can play a key role in providing effective solutions. 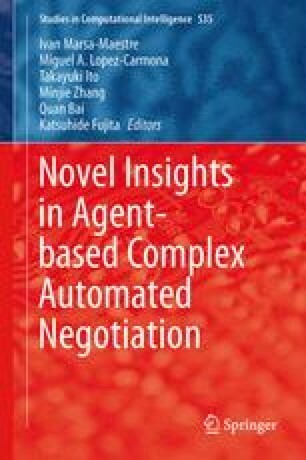 This paper presents two variants of feedback based multilateral negotiation protocol in which a mediator agent generates bids and negotiating agents give their feedback about those bids. We investigate different types of feedback given to the mediator. The mediator uses agents’ feedback to models each agent’s preferences and accordingly generates well-targeted bids over time rather than arbitrary bids. Furthermore, the paper investigates the performance of the protocols in an experimental setting. Experimental results show that the proposed protocols result in a reasonably good outcome for all agents in a relatively short time. This research is supported by the Dutch Technology Foundation STW, applied science division of NWO and the Technology Program of the Ministry of Economic Affairs; the Pocket Negotiator project with grant number VICI-project 08075 and the New Governance Models for Next Generation Infrastructures project with NGI grant number 04.17. We would like to thank Mark Klein for his help about mediated single text negotiation, and also Maaike Harbers and Wietske Visser for their valuable comments.